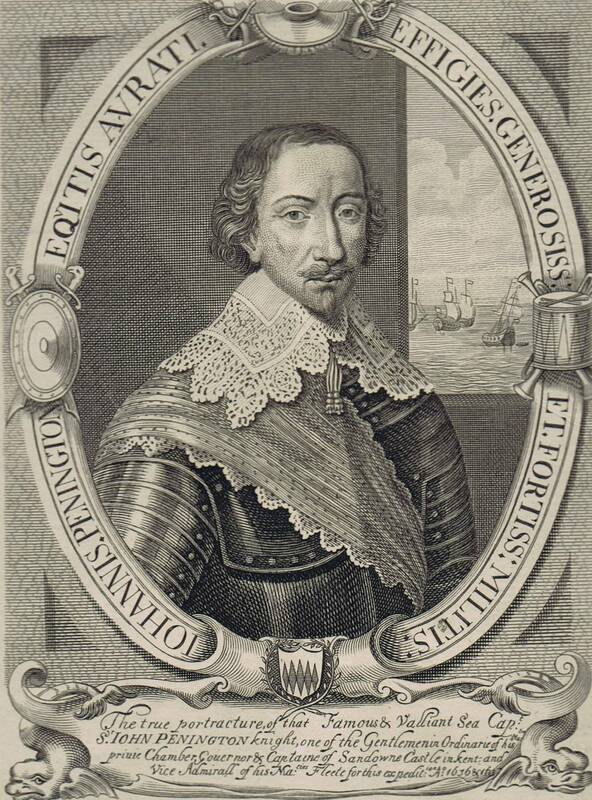 Admiral Sir John Pennington, of King Charles I’s Fleet, was also Treasurer of His Majesty’s Navy, and one of the Gentlemen of His Majesty’s Privy Chamber in Ordinary, Captain of Sandown Castle; knighted on board H.M.S. Unicorn April 14, 1634. He was baptised at Henham, January 30, 1568, and died unmarried in September 1646. William Pennington, elder brother of the Admiral’s grandfather, was born at Henham, County Essex; was a citizen of London in 1557, and was buried at St. Benet’s, Gracechurch Street, London, November 11, 1592. His widow, Alice Pennington was interred at the same place, October 9, 1607, the burial notice speaking of her as “an ancient householder.” The children of Alice and William Pennington had eight children Jacob, Robert, Arthur, William, Mary, Thomas a daughter, name unknown, who married Daniel Shetterdon, and Anne. At the beginning Edward Penington evinced a disposition to contest the arbitrary action of the mother country. To this end he attended the Provincial Conference of May, 1774, at the Coffee house, which created the Committee of Correspondence, and he was also a delegate to the Provincial Convention, held in July, of the same year. Although that is as far as he was willing to go. Anything further meant war, and to war he was conscientiously opposed. He became classed among the “disaffected,” therefore, and in 1776, was ordered under arrest, although he was subsequently liberated. In September of the following year, however, upon the approach of the British Army from the Chesapeake, Penington was again arrested, by order of the Supreme Executive Council of the State, confined for a time in Freemason’s Lodge, and then, together with nearly twenty others, mostly Quakers, was sent to Virginia, under guard, where he was compelled to remain eight months, until released by order of the Continental Congress. The eldest of the six sons, John Penington, had a national reputation as a scholar, antiquary and bibliophile. He was born August 1, 1799, and died March 18, 1867.